This faction honestly really bugs me. There's no introduction to them, you just suddenly start gaining rep at 110. How do they know me? How do I know them? Why do I want to gain rep with them, especially as a demon hunter? Slowest of the reputations of Broken Isles to gain so far, unfortunately required for Broken Isles Diplomat/ Broken Isles Pathfinder, Part One. i suggest downloading https://mods.curse.com/addons/wow/worldquestgroupfinder addon while doing those quest because quest mobs can be quite challenging. A real grind for this factions rep. The max rep you gain is 275 from WQ (high level NPC's) & there are limited chances per day to earn any rep at all, unlike with other factions. Not sure if raids offer greater rep, only a casual player so don't do them. Dungeons (if flagged accordingly) do offer Warden rep. Sadly you need to reach Revered in order to complete the Glorious Campaign achievement, so be prepared for a long haul, if like me you can't spend hours in front of your computer. Cordana Felsong at Vault of the Wardens appears to give to reputation with The Wardens when downed. So if you're only interested in hitting Revered, you could repeatedly run through normal Vault of the Wardens gaining 250 rep for every clear. From Honored to Revered, that's 48 runs. 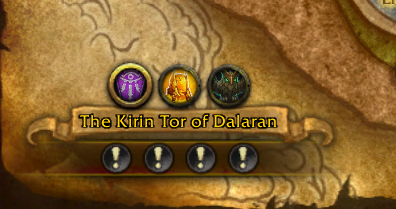 Trying to unlock flying in 7.3, Wardens rep is the main hurdle. Armies of the Legionfall rep was a couple of days and the other factions have enough quests to take you really close to revered if you just do the emissaries while plowing normally. Wardens is just a pain, I've had everything else completed for a few days now and only about halfway revered with Wardens. Looks like it goes at about 600 rep per day so 10 more days without emissaries. Making me hate the faction. Vault of the Wardens DOES NOT give Reputation unless there is a World Quest over it. Magister Phaedris gives 83 wardens/ 83 nightfallen reputation when the WQ is up. If you take the Lunastre Estates portal he is right there. During an Legion Assault in a Broken Isles zone, "Elite" quests give 150 reputation with the Wardens. During a Legion Assault in a Broken Isles zone, "Elite" quests give 150 reputation with the Wardens.